A top Pakistani aide, accusing Indian Prime Minister Narendra Modi of "misleading" BRICS and BIMSTEC nations, has asserted that New Delhi has no moral ground to talk about counter-terrorism as it is itself involved in terrorism in Kashmir. "Modi is misleading his BRICS and BIMSTEC colleagues and has no moral ground when his own government is involved in state terrorism in Kashmir," Radio Pakistan quoted Sartaj Aziz, Adviser to Pakistan Prime Minister on Foreign Affairs, as saying on Sunday.Aziz's remark came in response to Prime Minister Modi's statement at the BRICS Summit in Goa in which the Indian Premier said Pakistan was the "mothership of terrorism". "The Indian leadership is desperately trying to hide its brutalities in Jammu and Kashmir, an internationally recognised dispute on the UN Security Council agenda, where innocent people are being killed and injured by security forces daily with impunity," said Aziz. The Kashmir valley has been gripped with violence for the past 100 days following the July 8 killing of top militant Burhan Wani in a clash with the security forces.More than 90 persons have been killed and over 12,500 injured since the violence -- the worst since the 2010 unrest -- began on July 9 between the security forces and protestors in Kashmir.Aziz said the people of Kashmir Valley were being "subjected to genocide by India" for demanding their fundamental right to self-determination, as promised in the relevant UNSC resolutions.He said the UN High Commissioner for Human Rights in Geneva and the Secretary General of the Organisation of Islamic Cooperation (OIC) have called for sending a fact-finding mission to Kashmir. 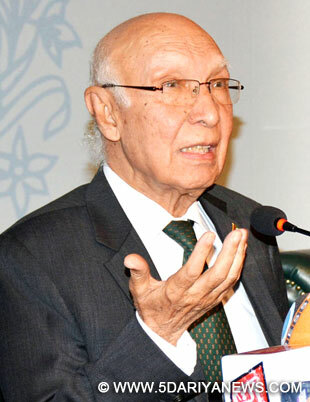 "The UN and OIC have rejected Indian attempts to equate Kashmiris' movement for self-determination with terrorism," the adviser said, adding that the UN has emphasised that people fighting for their self-determination cannot be categorised as terrorists.According to Aziz, Pakistan joins all the members of BRICS and BIMSTEC in condemning terrorism and reaffirms its full commitment to fighting the menace without discrimination. "Pakistan's sacrifices in the war against terrorism are well acknowledged and repeatedly appreciated by the leadership of most countries in the world," he said.Aziz further said that Islamabad is a victim of Indian "interference and subversive activities" which, he claimed, were aimed at destabilising Pakistan. "Unfortunately, in complete disrespect of international law and the UN Charter, the Indian government is pursuing its hegemonic designs. "The adviser called upon the international community, especially the BRICS leaders, to "ask India to stop the bloodshed in Kashmir immediately, release Kashmiri leaders and thousands of Kashmiris taken away forcibly and address the humanitarian crisis" in the valley.Earlier on Sunday, while addressing BRICS leaders in Goa, Modi called for a strong united stand against the "mothership of terrorism in South Asia", a reference to Pakistan. "In our region, terrorism poses a grave threat to peace, security and development," Modi told the leaders at the BRICS Summit.